Too Fat to be Buried? 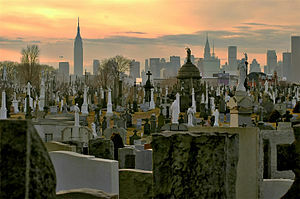 Graveyard Gridlock was the headline on the cover of the New York Times Real Estate section 2 weeks ago. Evidently the local New York City cemeteries are running out of space to lay the “newly departed” to rest. “Price per square foot” or “ppsf ” is common lingo used in real estate evaluation but it is now applied to “cemetery speak”. The littler and skinnier you are, the cheaper your final resting place may be. Even though Americans on average are larger and heavier than ever before, Washington Cemetary in Brooklyn has a strict policy on casket size. No caskets can be wider than 26 inches wide. “They got to squeeze them into the box”, said groundskeeper Charlie Anderson. Other cities experiencing this problem have initiated “alternative solutions”. In London, some cemeteries permit people to be buried upright. In Singapore and Sydney some cemeteries have offered plots for “limited tenure”. This means that after a specified amount of time, the plots can be reused, replacing the old coffins along with their old inhabitant with new coffins with new occupants. This article did not mention where the old coffins and their inhabitants go. Perhaps some things are best left un-said. Space is so limited that I wonder how long it will be before these graveyards start offering solutions masked as discounts. “Two for one specials” whereby you squeeze two caskets on one plot may be not so far off. In fact it may have already started as, according to this article, some cemetary operators have resorted to “stacking coffins nine-deep”! So what happens to our loved ones who can’t fit into the requisite 26 inch wide casket? The thought of physically cramming our dearly departed into the narrow box is very disconcerting. But what can we do? It’s too late for a diet. It’s too late for gastric bypass surgery. Where do our heavy loved ones go? Can they buy 2 plots to have a little more “breathing room”? With prices running on average $10,000 per plot that option clearly, if even available, would be out of the question for most of us. However they may not have a choice. They may be forced to resort to the controversial policy initiated by airlines that the obese must purchase 2 adjacent seats (or plots in this case) in order to be permitted to take the “grand voyage”. Is the only reasonable option left to be cremated thereby eliminating this worrisome developement? According to this article, almost 25% of all New Yorker’s have been selecting cremation over burial. With that said, I think that the most reasonable solution is to lose those pesky pounds. If not for yourself now than for your eternal comfort in the after-life. Next Grin and Bear It. Thanks for this post (and the others). I’ve been following your blog since I learned about it. While about a serious subject, you tackled it with your usual entertaining way, “peppered”with relevant information. Anyway, this made me laugh myself out of some unpleasant news! I wonder – if caskets are stacked nine deep, would the nine names be “listed” in order (1. Jane Doe, 2. Joe Schmo, etc.). Would marker space be limited to just the names sans the other usual remarks like “Beloved mother and wife of……”? Oh yes, like in Singapore and Sydney, the practice of “limited tenure” occurs in the Philippines where coffin spaces can be “leased” for a given time. And no, I have no idea what happens to the coffins and bodies whose “lease” are up. What happens if the relatives who signed the “lease” agreement opt not to “renew” the leased space due to finances, or other reasons?